An unprecedented land grab is taking place around the world. Fearing future food shortages or eager to profit from them, the world’s wealthiest and most acquisitive countries, corporations, and individuals have been buying and leasing vast tracts of land around the world. The scale is astounding: parcels the size of small countries are being gobbled up across the plains of Africa, the paddy fields of Southeast Asia, the jungles of South America, and the prairies of Eastern Europe. Veteran science writer Fred Pearce spent a year circling the globe to find out who was doing the buying, whose land was being taken over, and what the effect of these massive land deals seems to be. 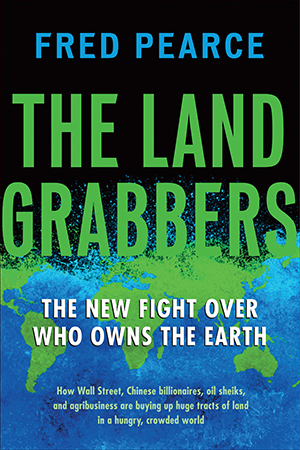 The Land Grabbers is a first-of-its-kind expose that reveals the scale and the human costs of the land grab, one of the most profound ethical, environmental, and economic issues facing the globalized world in the twenty-first century. The corporations, speculators, and governments scooping up land cheap in the developing world claim that industrial-scale farming will help local economies. But Pearce’s research reveals a far more troubling reality. While some mega-farms are ethically run, all too often poor farmers and cattle herders are evicted from ancestral lands or cut off from water sources. The good jobs promised by foreign capitalists and home governments alike fail to materialize. Hungry nations are being forced to export their food to the wealthy, and corporate potentates run fiefdoms oblivious to the country beyond their fences. Pearce’s story is populated with larger-than-life characters, from financier George Soros and industry tycoon Richard Branson, to Gulf state sheikhs, Russian oligarchs, British barons, and Burmese generals. We discover why Goldman Sachs is buying up the Chinese poultry industry, what Lord Rothschild and a legendary 1970s asset-stripper are doing in the backwoods of Brazil, and what plans a Saudi oil billionaire has for Ethiopia. Along the way, Pearce introduces us to the people who actually live on, and live off of, the supposedly “empty” land that is being grabbed, from Cambodian peasants, victimized first by the Khmer Rouge and now by crony capitalism, to African pastoralists confined to ever-smaller tracts. Over the next few decades, land grabbing may matter more, to more of the planet’s people, than even climate change. It will affect who eats and who does not, who gets richer and who gets poorer, and whether agrarian societies can exist outside corporate control. It is the new battle over who owns the planet. Soaring grain prices and fears about future food supplies are triggering a global land grab. Gulf sheikhs, Chinese state corporations, Wall Street speculators, Russian oligarchs, Indian microchip billionaires, doomsday fatalists, Midwestern missionaries, and City of London hedge-fund slickers are scouring the globe for cheap land to feed their people, their bottom lines, or their consciences. Chunks of land the size of small countries are exchanging hands for a song. So who precisely are the buyers--and whose land is being taken over? I spent a year circling the globe to find out, interviewing the grabbers and the grabbed on every continent, from Jeddah, London, and Chicago to Sumatra, Paraguay, and Liberia. Almost everyone seems to be a land grabber today. My cast of characters includes super-financier George Soros and super-industrialist Richard Branson; Colombian narco-terrorists and Italian heiresses; an Irish dairy farmer in the Saudi desert and the recent commander of British land forces, now tilling soil in Guinea; gun runners and the couple who sold the world high fashion with the Patagonia brand before buying the wild lands of the same name. I discovered how logging concessions in central Africa may have helped elect Nicolas Sarkozy as president of France; what Lord Rothschild and a legendary 1970s asset stripper are doing in the backwoods of Brazil; who is buying Laos and Liberia, and who already owns Swaziland; how Goldman Sachs added tens of millions to the world’s starving; the dramatic contrast between Kenya’s Happy Valley and Zimbabwe’s Hippo Valley; who grabbed a tenth of the new state of South Sudan even before it raised its flag; why Qatar is everywhere; and what links a black-skinned Saudi billionaire to Bill Clinton, Ethiopia’s ex-freedom-fighting prime minister, and rich cattle pastures at the head of the Nile. I found an evangelical American ex-prison boss draining bogs on the shores of Lake Victoria; a dapper English banker plowing up the Brazilian cerrado grasslands; Saudi sheikhs in Sudan, extending the world’s largest sugar farm; the Moonies seeking “heavenly life” by grabbing Paraguayan jungles; and Gaddafi’s doomed henchmen annexing black earth in Ukraine and yellow sands in Mali. The Kidmans and Windsors and Gettys and Khashoggis and Oppenheimers are in there too--and most likely you, or at least your pension fund, have a slice of the action. Some regard the term land grabbers as pejorative. But it is widely used, and the subject of academic conferences. I use it here to describe any contentious acquisition of large-scale land rights by a foreigner or other “outsider,” whatever the legal status of the transaction. It’s not all bad, but it all merits attention. And that is the purpose of this book. I have been in awe at the grabbers’ sheer ambition, and sometimes at their open-hearted altruism too. Some want to save their nations from a coming “perfect storm” of rising population, changing diets, and climate change. Others look forward to making a killing as the storm hits. Many believe they will do good along the way. But I have been appalled at the damage that often results from their actions. Their hosts share much of the blame for what goes wrong. After years of neglecting their agriculture, African governments are suddenly keen to invest. Their desire for a quick fix to deep-seated problems makes foreign investors, with their big promises, attractive. Many governments ask few questions when investors come calling. They clear the land of existing inhabitants, and often don’t even ask for rent. There is often an unspoken cultural cringe, in which foreign is always considered best. The investment, ministers believe, will inevitably bring food and jobs to their people. But such easy assurances rarely work out, for reasons that are social, environmental, economic, geopolitical--and sometimes a toxic mix of all four. There is much uncertainty about how much land has been “grabbed,” and how firm the grasp of the grabbers is. In 2010, the World Bank came up with a figure of 120 million acres. The Global Land Project, an international research network, hazarded 150 million acres. The Land Deal Politics Initiative, another network of researchers that helped organize a conference in Britain on land grabbing in mid-2011, totted up 200 million acres. Within weeks, Oxfam, an aid agency, published its own estimate of 560 million acres. The truth is nobody knows. There is no central register; there is little national transparency. Some of the largest deals were done in secret and unknown even to the most diligent NGOs, while other deals have attracted headlines but have never come to fruition. I have tried to disentangle the truth about individual projects, but I have not attempted any global figure. I hope I have reported fairly. I did find new mega-farms with thoughtful managers who make sure to offer secure jobs, food, and basic social services to their workers and their families. I found others with vibrant “out-grower” schemes that supported nearby peasant farmers and bought their produce. I found investors with a long-term view. But I also found poor farmers and cattle herders who woke up to find themselves evicted from their ancestral lands; corporate potentates running enclave fiefdoms oblivious to the country beyond their fences; warlords selling land they don’t own to financiers they have never met; hungry nations forced to export their food to the wealthy; and speculators who buy land and then disappear without trace. I was reminded repeatedly of scenes from books like John Steinbeck’s Grapes of Wrath and Joseph Conrad’s Heart of Darkness. Yet industrial-scale farming is what most land grabbers have in mind. According to Graham Davies, consultant to the British private equity company Altima Partners, the “vast majority” of investors in Africa are only interested in commercial Western-style agriculture, “largely ignoring” the continent’s 60 million small farms that produce 80 percent of sub-Saharan Africa’s farm produce. It is important to know what agribusiness can and cannot deliver. But it is equally important to be angered by the appalling injustice of people having their ancestral land pulled from beneath their feet. And to question the arrogance and ignorance surrounding claims, by home governments and Western investors alike, that huge areas of Africa are “empty” lands only awaiting the magic of foreign hands and foreign capital. And to balk at the patina of virtue that often surrounds environmentalists eagerly taking other people’s land in the interests of protecting wildlife. What right do “green grabbers” have to take peasant fields and pastures to grow biofuels, cordon off rich pastures for nature conservation, shut up forests as carbon stores, and fence in wilderness as playpens and hunting grounds for rich sponsors? They are cooking up a “tragedy of the commons” in reverse. Over the next few decades I believe land grabbing will matter more, to more of the planet’s people, even than climate change. The new land rush looks increasingly like a final enclosure of the planet’s wild places, a last roundup on the global commons. Is this the inevitable cost of feeding the world and protecting its surviving wildlife? Must the world’s billion or so peasants and pastoralists give up their hinterlands in order to nourish the rest of us? Or is this a new colonialism that should be confronted--the moment when localism and communalism fight back? I began and ended my journey round the world in the cockpit of the greatest land grab in history--the unfenced plains of Africa, where governments, corporations, and peasants seem set to fight for the soil of their continent. I started with a man called Omot. Pearce's story is populated with larger-than-life characters, from financier George Soros and industry tycoon Richard Branson, to Gulf state sheikhs, Russian oligarchs, British barons, and Burmese generals. We discover why Goldman Sachs is buying up the Chinese poultry industry, what Lord Rothschild and a legendary 1970s asset-stripper are doing in the backwoods of Brazil, and what plans a Saudi oil billionaire has for Ethiopia. Along the way, Pearce introduces us to the people who actually live on, and live off of, the supposedly "empty" land that is being grabbed, from Cambodian peasants, victimized first by the Khmer Rouge and now by crony capitalism, to African pastoralists confined to ever-smaller tracts. Over the next few decades, land grabbing may matter more, to more of the planet's people, than even climate change. It will affect who eats and who does not, who gets richer and who gets poorer, and whether agrarian societies can exist outside corporate control. It is the new battle over who owns the planet. Fred Pearce is an award-winning former news editor at New Scientist. Currently its environmental and development consultant, he has also written for Audubon, Popular Science, Time, the Boston Globe, and Natural History and writes a regular column for the Guardian. He has been honored as UK environmental journalist of the year, among other awards. His many books include When the Rivers Run Dry, With Speed and Violence, Confessions of an Eco-Sinner, and The Coming Population Crash. Referring to westerners who buy land in Africa, Fred Pearce writes, “The question is whether the new colonialists are there to develop Africa or ransack its resources. Will they feed the worldor just the bottom line?” Do you think any of the land grabbers are invested in helping the African people? Is it possible for them to make a positive impact? Why or why not? Pearce writes, “The land is our supermarket and our grain reserve.” In what ways has our society become distanced from this concept? How does that distance hurt our relationship with other societies and with the environment? In this chapter, Pearce writes, “Speculators are no longer oiling the wheels of the global food supply engine. They are in charge of a runaway train.” Were you surprised to learn how market speculation may have impacted the world food supply? Can you think of a viable solution to this problem? Some nations, like Saudi Arabia, engage in land-grabbing in order to prevent a food shortage. Are their fears of foreign dependence justified? How else could their needs be addressed? Chapter 4 highlights the vague and confusing terms in which land-grab deals are often phrased. How do these vagaries and loopholes benefit the “capitalists of chaos”? In this chapter, Pearce writes, “The story of Yala swamp shows how even outsiders with the best of intentions can create severe problems.” Were you aware of the ineffective and even harmful aspects of environmental foreign aid? If Calvin Burgess really had good intentions, how did his plans go wrong? The land grabs in Liberia were especially harmful because the nation’s tyrant ruler sold logging rights in order to buy arms. What are your thoughts on the intersecting nature of many of Africa’s political and humanitarian issues? What other roles have foreign land grabs played in relation to those issues? Pearce writes that Peter Bayliss’s palm-oil plantation is “as good as it gets.” What traits make it less problematic than most of the other enterprises described in this book? What could other land grabbers learn from this example? How are “ordinary people” convinced to invest in land-grab schemes? How might westerners be provided with more information about the effects of land grabbing? Pearce writes that “Ukraine is potentially the breadbasket of Europe” but “thanks to the political turmoil and the dead hand of bureaucracy those soils have never fulfilled their potential.” Were you surprised by the strong role politics has played in creating food shortages? How do land grabs exacerbate the situation? More than 60% of the Brazilian cerrado has been lost to industrial farming, but Pearce writes that “the outrage has been minimal.” Why do you think that is? What factors decide whether or not this kind of crisis comes to be widely known and condemned? The Chaco is known as a “museum of biodiversity” and the home of uncontacted tribes, and Pearce clearly condemns its destruction. However, he also tells the complex stories of some of the people who have caused that destruction. How do you feel about the Mennonites and the Moonies after reading his account? Why do you think Pearce shared both sides of the story? How did the rubber-tapping industry in South America breed such a devastating environment for its workers? Were you shocked by the descriptions of cruel punishments and slavery-like conditions? Do you think such a thing could happen again? How do “green grabs” change or expand your understanding of land grabbing? Do you feel that land grabs for environmental reasons are justified? In Australia, foreigners have taken advantage of droughts to buy up the land of desperate farmers. Pearce writes that Australians are “in danger of becoming servants and not masters of their own food resources.” Should there be laws regulating when and under what circumstances land can be purchased? A native of the Riau rain forest tells Pearce, “The district government said that it would issue a warrant for the [logging] company to stop…But the company ignored that. I have had no response since.” Many instances of land grabbing in this book involve a blatant disregard for local, national, and international laws. How could these laws be better enforced? Why aren’t they being enforced now? How have the indigenous people of Papua New Guinea been effected by logging? Why do you think Pearce calls this “one of the most outrageous, mysterious, and little-known land grabs anywhere in the world”? Pearce refers to the “casual indifference to people’s rights” that characterizes the land grabs in Cambodia. Can you think of other historical examples of traditional land rights being ignored? What circumstances make this kind of land grabbing possible? How has China taken control of land throughout Asia? What circumstances cause neighboring countries to agree to fulfill China’s needs? How has the “preservation” of the Serengeti led to the exploitation of the land and its native inhabitants? Does this kind of tourism really benefit the people of Tanzania? Pearce writes that South African land grabbers have “organiz[ed] the expulsion of tribal groups from their land on the pretext of preserving wildlife” and that “[t]he result…was often to alienate the very people who had successfully shared the land with big game for centuries.” What ideas did you have about the indigenous uses of land and wildlife before reading this book? Have your ideas changed? Pearce writes that the land grabbers are “beginning to look just as narrow and selfish as the imperialists of old.” What do you know about the history of imperialism in Africa? Is the comparison justified? Pearce writes about land grabs being carried out with no maps and no authentic leases. Why do so many land deals in Africa involve so little oversight? Who is at fault, and what are their motives? This chapter discusses the complexities of the “carbon footprint” concept. Were you familiar with this concept before reading the chapter? Were you surprised by Pearce's ultimate conclusion about the practicality of biofuels? Robert Mugabe’s land reforms ostensibly started as a form of social justice, transferring land from white colonialists to black smallholders. How did this process become corrupt? How do some African governments collude in and benefit from the land grabs that exploit their people? What were the original intentions of the carbon-credits system, and how has it been corrupted to serve the needs of land grabbers? Water grabs are being carried out in Mali on such a scale that entire communities will be literally unable to sustain themselves. Can you imagine your own community being deprived of vital resources and receiving no aid? What makes the villages of Mali particularly vulnerable? Had you heard of the “tragedy of the Commons” before you read this chapter? What was your reaction to Pearce’s analysis of this concept? After hearing various sides of the story, what are your beliefs about the future of world food production? Do you agree with Pearce's conclusion that small-scale farming is the answer? What part will land grabs play in this future? What did the phrase “land grabbing” bring to mind before you read The Land Grabbers? Was there anything in the book that surprised you or changed your notions of this concept?